Havant and Waterlooville manager Lee Bradbury says his side will relish the underdog tag in their FA Cup fourth qualifying tie against Cheltenham. Havant are currently 17th in the National League South, a division below the Robins, managed by ex-Bristol City and Yeovil boss Gary Johnson. "Being the underdog, we can have a real good go at it," 40-year-old Bradbury told BBC Radio Solent. "It's one we can relish and we can give everything we've got at it." Cheltenham are currently second in the National League after a 1-1 draw at Gateshead on Saturday and Bradbury is fully aware of his opposite number's managerial pedigree. "They have an experienced manager who has gone there trying to get them back up. 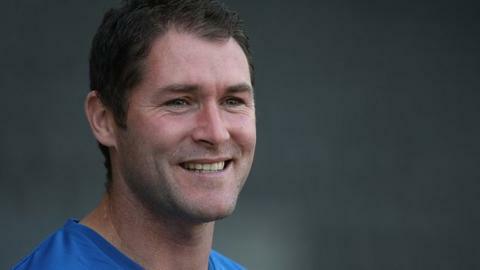 "He has a good knowledge of the game and he has been in the game a long time," added the former AFC Bournemouth manager. Havant famously made it to the FA Cup fourth round in 2008 when they eventually lost to Liverpool 5-2, but have never before played Cheltenham in the competition.